The anklyosaurus was covered in flexible armor plating made from bone. Its tail held a massive bone club, perfect for whacking a predator. Its head was also covered in bony armor. Although the anklyosaurus couldn’t move quickly, its armor kept it well protected. Unless a predator could reach its throat and underside, this dinosaur had a good chance of survival. The Anklyosaurus was discovered in the U.S. and Canada in 2006. It lived on plants and grew 33 feet long, making it one of the largest of the armored dinosaurs. The anklyosaurus had a wide, beaked mouth, and flat teeth for shredding plants. Scientists have never found a complete skeleton of an anklyosaurus. They know what it probably looked like from studying other dinosaurs in the Anklyosauria family. The dinosaur’s armor was solid bone with lightweight bone between it. This design made it light enough for the dinosaur to move freely. See images of this dinosaur’s armor. Declan, Tobin. " All about Anklyosaurus for Kids ." Easy Science for Kids, Apr 2019. Web. 24 Apr 2019. 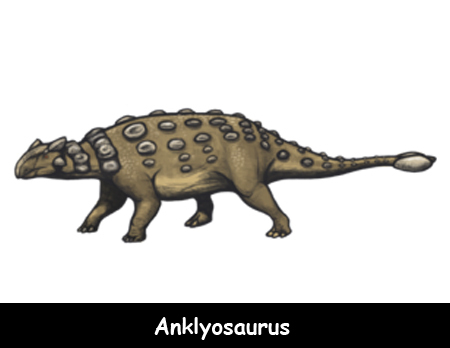 < https://easyscienceforkids.com/anklyosaurus/ >.